For more than 25 years, Specs has been providing chemical compounds to pharmaceutical and biotechnology companies for drug discovery. Annually, more than 1.5 million structures are offered by academia and research institutes from all over the world. Only those compounds that meet the Specs selection criteria are added to our collection. Compounds must fulfill a certain number of criteria before they are included in our corporate database. First of all, the structure must be new, the compound has to exhibit structural characteristics of a biologically active compound, and meet Absorption Distribution Metabolism Excretion (ADME) requirements. Increased structural diversity is correlated with global sourcing of compounds. For this purpose Specs maintains compound acquisition offices in Pune (India) and Shanghai (China). Before a compound is added to the Specs repository, the compound must meet strict analytical criteria. 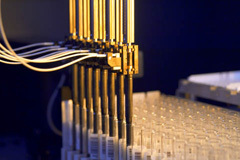 At the Specs laboratory, all compounds are subjected to LC/MS and 1H-NMR analysis. The chemical structure is confirmed and the purity must be at least 90%. Most compounds though have a purity higher than 95%. All LC/MS and 1H-NMR data are available through Specs.net, our online catalogue, and are provided electronically to the customers with their orders. Compounds can be supplied in customer preferred material (vials as well as plates, with customized barcode labeling). The screening compounds can also be delivered in mass or molar quantities, in DMSO solution or dry film. In case a certain compounds shows activity in the drug discovery screenings, a confirmation sample can be obtained. Our re-supply rate is over 90%. From all compounds in the Specs stock, a small amount is retained, and only available to customers who have purchased the compound before.